Braselton, Ga. – Le Mans 24-hour winner Peugeot became a strong favorite to add the Petit Le Mans to its trophy case after qualifying at Road Atlanta. A brace of factory 908 HDI FAP’s swept the front row in the hands of Nicolas Minassian and Franck Montagny with little challenge from the teams of Audi and Acura. The two Audi Sport entries occupied the second row ahead of the Acura ARX-02a of de Ferran Motorsports in fifth. Highcroft Racing continued building an Acura from a new tub delivered after Scott Sharp’s Thursday crash. The team, battling de Ferran for the LMP1 championship of the American Le Mans Series, was expected to be ready for the morning warm-up on Saturday prior to the 11:20 a.m. start. The Peugeot squad is ready whatever the weather may hold, including possible thunderstorms. 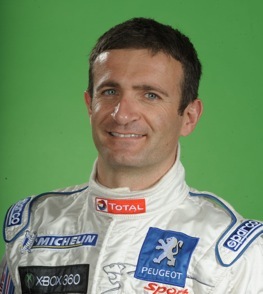 Minassian, who will co-drive with Pedro Lamy in the No. 07 Peugeot, said the 908 chassis could quickly be adapted to rainy conditions — or would handle well on a hot, slippery track. Beaten by Audi at Le Mans during rainy events in 2007 and 2008, the development of the low downforce French car’s traction control has been the key to its success. The compliant, three-year-old Peugeot diesel V-12 was quickest with an average lap of 136.606 mph around the 2.54-mile Georgia track while this year’s new Audi R15 TDI continued to be difficult to handle. A crash by Lucas Luhr in practice was a reminder the V-10 diesel-powered R15 tends to unexpectantly break loose at the rear, a problem manifested at Le Mans this summer as well. Dindo Capello, who will drive with defending race winner Allan McNish, qualified the No. 2 Audi in third, 1.263 seconds adrift from the pole. Luhr was fourth, 1.291 seconds behind Minassian. Officially, both Audi and Peugeot are testing in preparation for next year’s Le Mans 24-hour. But the race is the rubber match for the two factory teams this year. Audi won at the Sebring 12-hour in March in the debut of the R15 before Peugeot broke through for the first victory at Le Mans by the vaunted 908. Although the Road Atlanta circuit bears little resemblance to the eight-mile circuit in France, the European factory teams like the major long distance races in the U.S., because they are the only major endurance contests where their cars are eligible to compete outside of Le Mans. Also, due to budget cuts, both Audi and Peugeot are literally testing this year instead of competing in the North America all season or the Le Mans Series in Europe. After losing a dramatic finish at the Petit Le Mans last year, the Peugeot squad is borrowing a page from Audi by having only two drivers instead of three. That makes it easier for drivers to stay in a rhythm and gives them more seat time during practice. But the effectiveness of the chassis will put great phsyical demands on two drivers sharing a car for the aproximately ten hours in the 1,000-mile race. Because the Le Mans rulebook used by the ALMS favors the diesel engines of Peugeot and Audi, the expectations for Acura in qualifying were muted. Unlike Sebring, where the ARX-02a won the pole, the Road Atlanta track’s elevation changes and variety of high-gear and low-gear corners proved too much for the Acura versus the diesels. McNish is not counting out the Acuras, which will have three drivers per car on what is expected to be a humid day after record rain fall in north Georgia last week. The Acuras have demonstrated better tire wear and good fuel mileage, which are advantageous in endurance events. “They’ve contested a relatively large number of races since (Sebring) and understand the car better,” said McNish. Marino Franchitti won the pole for the LMP2 class aboard the Lola-Mazda of Dyson Racing, which announced the sister car will compete with biobutenal fuel. It was the third straight pole for the younger brother of Dario Franchitti. …David Murry, a competitor at Road Atlanta since 1981, won the GT2 class pole in an upset, driving the Ford GT-R of Robertson Racing. The Riley-built Corvette driven by Tom Sutherland was second. Cynics suggested the factory teams from Corvette, BMW and Porsche were sandbagging for the benefit of the Le Mans rule makers. …The ALMS announced its nine-race schedule for 2010. The two biggest changes: a six-hour race at Mazda Raceway Laguna Seca will be held on May 22 instead of this year’s four-hour on Oct. 11 and the St. Petersburg race has been dropped. The IRL advanced the schedule for the St. Pete weekend, which falls too close to Sebring’s 12-hour for the ALMS participants. Laguna has decided to switch its Grand-Am Rolex Series date in May to the endurance event for the ALMS. – Jonathan Ingram can be reached at jingram@racintoday.com.